Sentinel - For seamless automation! Reduce IT overhead and eliminate unnecessary IT interaction when it comes to your print inventory management. SENTINEL, as a label software solution, requires little to no manual maintenance once it is configured. Any Data - Any System. SENTINEL's unique Mapper tool does all the work for you by decoding any type of data and automatically mapping it to text, bar codes, or images on your labels. You can automatically and continuously convert data from disparate systems like Oracle and SAP. 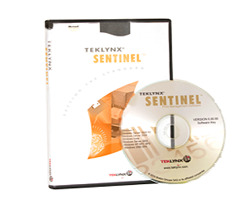 SENTINEL is a 6th generation barcode software product with quality proven by thousands of successful global installations. It integrates seamlessly with CODESOFT to offer unmatched flexibility and performance.